Several years ago my great aunt passed away (left) and last night I received word from Germany that my grandma (right)has passed away now as well. At age 93 one could say that she lived long, yet I can't shake this dreaded feeling that now that she is gone as well the glue that held us all together over miles and miles is now no more. My grandma was one of the strongest women I know. She and my great aunt had to endure a lot of hardship during World War II, yet she managed to raise three girls single handed and never loose her sense of humor. 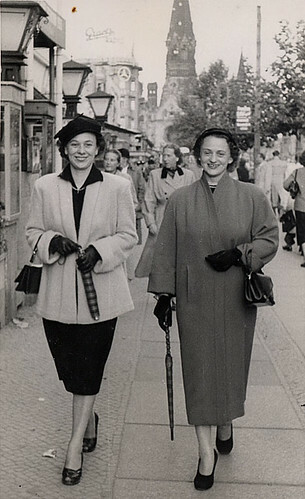 Berlin, my birthplace was always associated with Omi Elizabeth and Tante Gretel. She was a ball of fire, always ready for a prank and often had us all in stitches with her silly antics. Yet she could also be very demanding and set you straight before you had time to blink. Since I have moved to the United States I have seen her less and less, yet she has always occupied a big space in my heart that is now empty.